All photographs on this page � 2008 by Larry Kerecman. Do not reproduce without permission. As the date for the August 19, 2008 dedication of the new Electric Fountain approached, the software to run the fountain was being customized and tested. 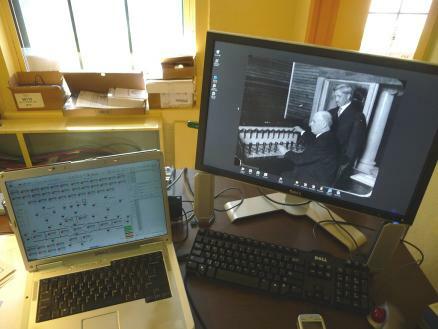 Here in a photo of the fountain control room (under construction) you see a preliminary version of the ACCESS fountain control software from Atlantic Fountains on the screen of the laptop (left) and a copy of the famous picture of Mayor Robert Speer and Frederic Darlington at the control desk of the 1908 Electric Fountain on the main fountain control PC monitor. The final configuration of the control room in the spring of 2009. The fountain operator can look out the window of the control room and see the fountain respond to the mouse clicks in real time. 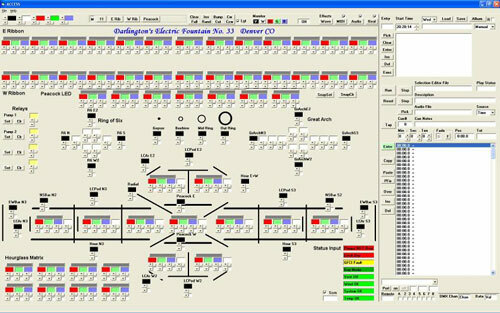 A view of the ACCESS musical fountain control software on the screen of the PC use to operate the fountain. All of the fountain valves, incandescent lights and multi-color LED fixtures can be controlled from this screen. Fountain shows are programmed and stored in a library. Then they can be put into the schedule for playback. The software has complete facilities for synchronization of fountain shows to music. We hope to have this feature operating in 2010. 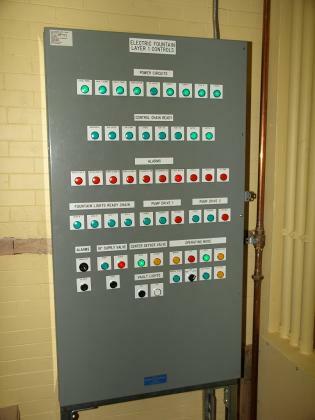 The main fountain safety interlock and control panel in the new control room has indicators to show the status of the fountain vault and pump operation at a glance. In addition to these controls, additional information is available to the fountain operator on the PC monitor. For security, video cameras provide a view inside the vault and from the bandstand. The vault lights can be turned on from this control panel. The copper pipe on the right carries compressed air from the compressor in the pump room out to the fountain vault. 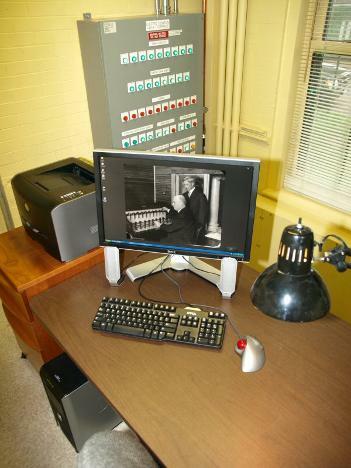 The devices on the interface panel under the desk top translate signals to and from the PC; digital information on a single pair of wires from the control room operates the lights and valves of the fountain. 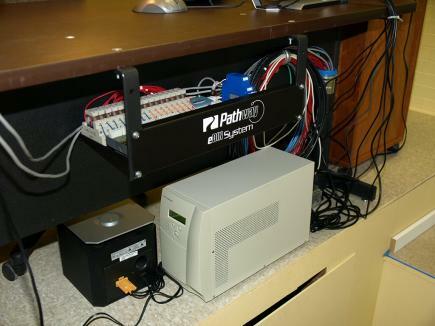 The battery backup system provides steady power for the PC.